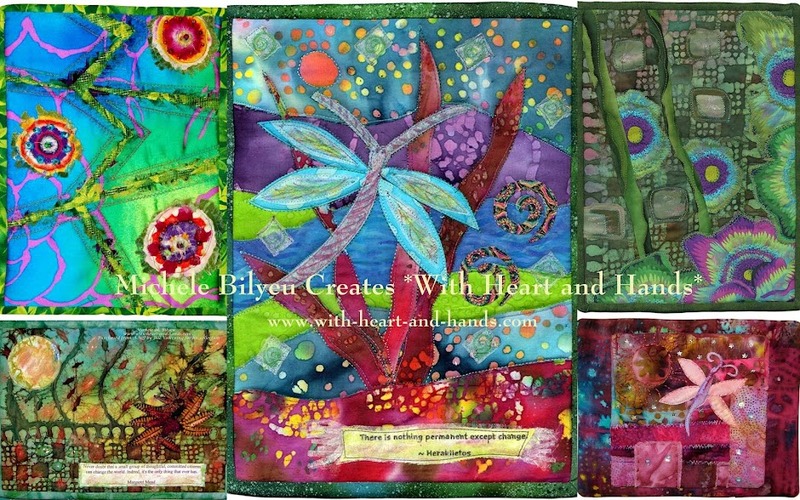 Michele Bilyeu Creates *With Heart and Hands*: Sisters Outdoor Quilt Show: ab-strakt-ed, improvisational, or modern? 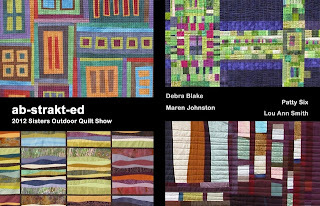 One of the most interesting discoveries of the 2013 Sisters Outdoor Quilt Show, was just how quickly, modern, abstract, and improvisational quilts have taken over the quilting scene. Now, I'm a firm believer in manifestation and what you are looking for or expecting to find, often jumps right out at you. Ever buy a new car and then see dozens of your style, your color, every place you go? 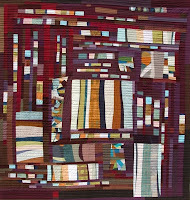 But, last year, I searched to find the ones that we perceived as being liberated or improvisational..outside of the "Teachers Tent" of course, as the Quilter's Affaire Instructors are always at the forefront of new movements as well as the stalwarts of the traditional approaches....and was surprised to see them primarily in the challenge or featured quilting sections, but far more limited in the regular quilt submissions. 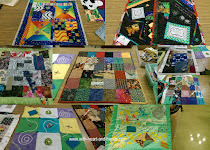 The group from Santa Barbara, California, and their wonderful featured challenge quilts...."ab-strakt-ed"...was probably my favorite among these. 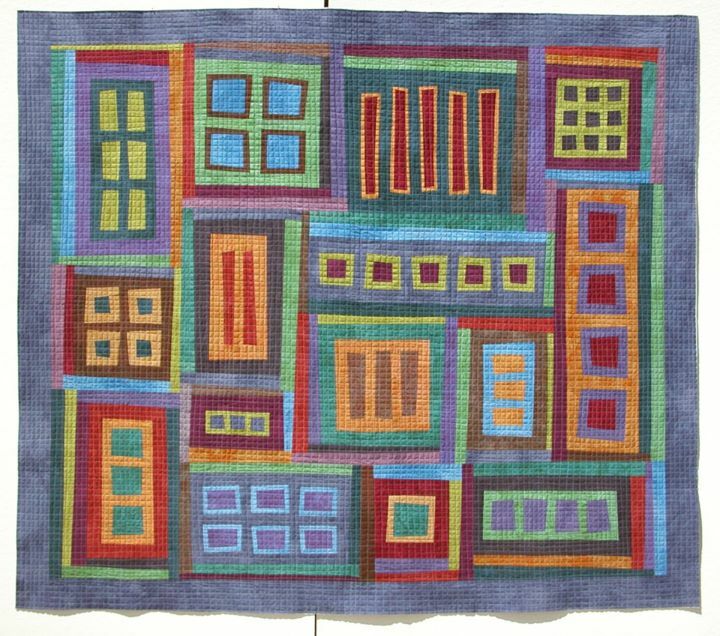 Not just bright and colorful, but they had a different intensity of presentation in design work and styling that caught the eye and kept it captured longer than those quilts that simply try to be 'modern' or be 'improvisational'. (Santa Barbara Quilt Returns had wonderful postcards to hand out. The list of visiting teachers is quite impressive! Jean Wells, Freddy Moran, Gwen Matston, etc. Ever see some one try to paint 'modern art' without have the background or talent. To them, it looks modern and they're proud of it but to anyone with visual differentiation you know instantly that all they did was try. This group, caught your eye and kept it interested..you knew they knew what they were doing! And it made you wish that you knew their secret path into their own 'ab-strakt-ed world, as well. These were fun and somehow still different. The lines were different, the whole approach was different. They didn't have to try so hard as so many quilters do. In fact, looking at the photos now, just the clothespins throw the designs off, suddenly I'm 'dis-trakt-ed by wooden clothespins, so I tune them out from my visual field and 'see' the quilts again! Some made their statement easily, while others were more complex. Sometimes, there eas a busyness to them which I initially found distracting, but then I decided that their 'ab-strakt-ed' feeling was accomplishing just that! This one, above, is an example. It rips me up inside on a visceral level and I can feel all kinds of questioning things going on. 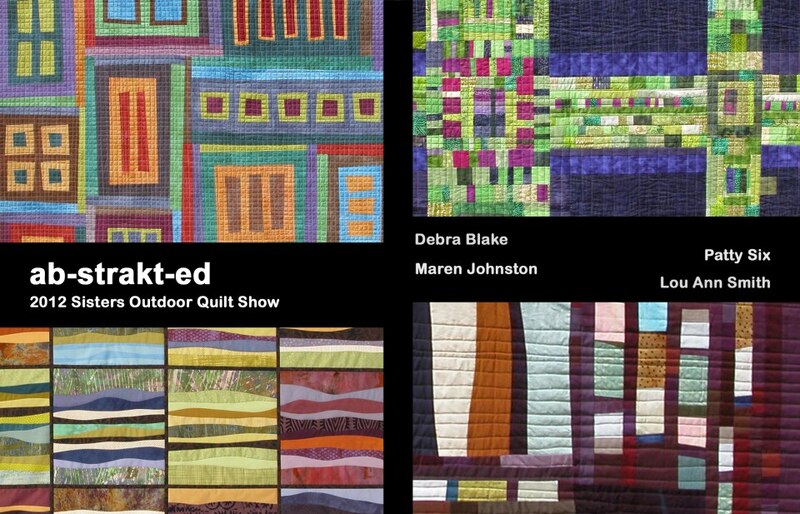 Isn't that just what an art quilt should do? Not sure, I like the ripping as much as the questioning and perhaps, harmony is easier on the senses in the end. But if they made me think of what was beyond the surface level..than to me, that felt like 'art speaks'. To show you what happens when one of us has a camera and the one in the hat doesn't, she ended up in all of my photos. 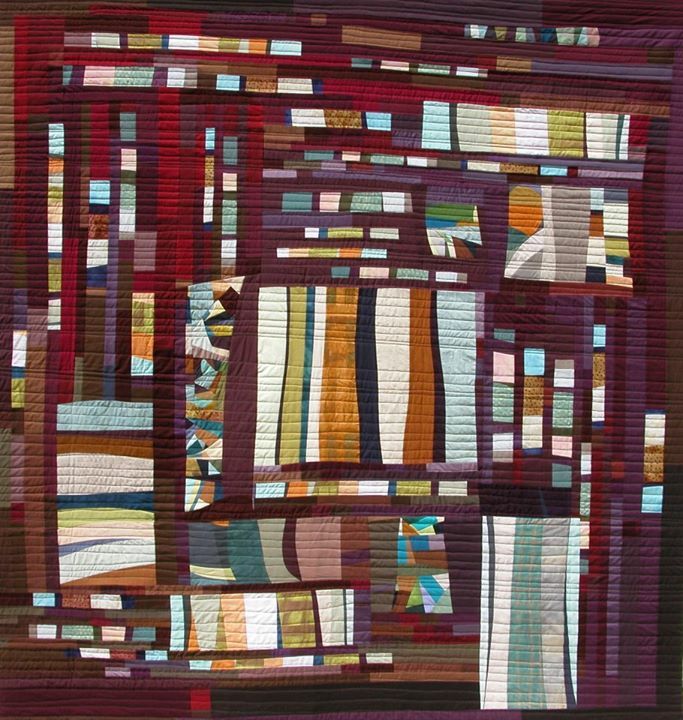 And the deliberately rustic setting of Sisters, while once emphasizing the traditional 'root's of the entire quilting movement and its history.....now creates an unusual contrast. Some of the same lines, some of the juxtaposed in and out of the beams at angles. And then sometimes, a quilter just took a different path, all together. I'm not sure where the one on the right was going, but that is just how I feel when I don't know either. So...'ab-strakt-ed' indeed. Some picking up of the bright colors of earth, wood, sky, and water...we are outdoors, after all...so how lovely to have all of these additions to the whole viewing experience! I loved how this quilt viewer stayed in my camera shot long enough for her image to be captured...doesn't she look like she 'belongs' to the trio of quilts behind her? And some of the 'ab-strakt-ed' and modern approaches fit in perfectly with the log cabin feeling of the scene...loved that! Always a favorite camera shot...the Stitchin' Post's side wall. 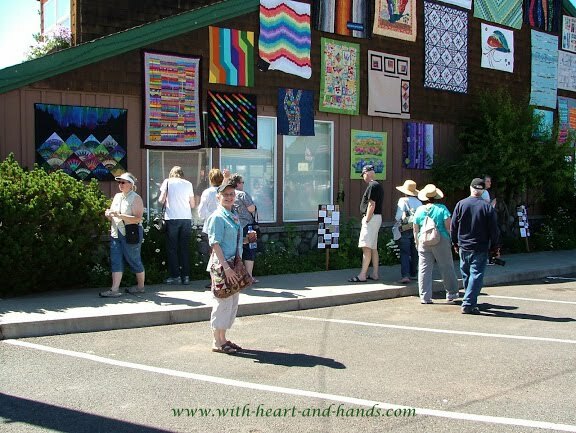 Here, the employees of that quilt shop have their own creations up on its large and lovely design wall. You have to crane your neck a bit to squint up into the sun and the sky..but what you see is a veritable rainbow of quilts. This year the challenge was 'Colors in the Stream' ...oh, look...there I am in the photo..teal gingham shirt and a camera to my eye! This one,above, reminded me of our Oregon Coast kite scene. You often see this simple little tube like kits up in mulitples. 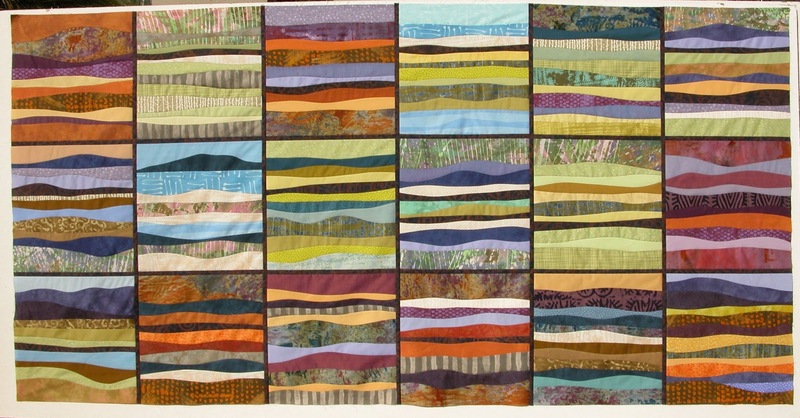 This quilt was simple strips, raw edge applique'. A lot of different interpretations of color, design, blocking, or emphasis. Some a bit more mosaic than others. And finally, a way for us to know just who created which quilt. Two display boards with photo of the quilt, their names and their quilt designer's names. Fun to pick out our own personal favorites one by one! And inside the Sisters Library..a bit of chronological order, here, but then space and time don't really exist and in my mind, the seldom even try to exist in any kind of order, anyway! And this more complex one, below, actally from the Paulina Springs Courtyard from 'Portland Modern Quilt Guild" Obviously, I'm out of order, again ;) Surprisingly, the PMQG courtyard didn't have as many quilts as last year. But then looking in the Quilt Show flyer, it became obvious that some of their owners did a 'show and dash' and took them down, and home before closing time. I think I'd be tempted to...hard to leave your quilt behind and head home without it! We actually overheard the overseer tell the volunteer...if you can follow all of that...that she was not 'leaving the quilts alone and taking a break'. She said as long as they were there, so was she!" A good foster quilt mom, if I ever overheard one! I don't think it matters what the quilt challenge...the colors in the stream still flow ...I guess it just depends on which stream you're flowing in at the time! I enjoyed them all, but then I sought to go with the flow as it was! Otherwise, I'm not only 'ab-strakt-ed', but dis-trackt-ed, and suddenly neither of my two handlers can find me, nor I them. Thanks, Doni and Cher..some how you kept me on track, as well as in the flow! Love the analysis and insight you've shared . . . not to mention the photos! I look forward to my virtual visit to the Sisters show each year! Thanks for sharing your photos! Thanks so much for your insightful comments about our exhibit and for posting photos of our work. 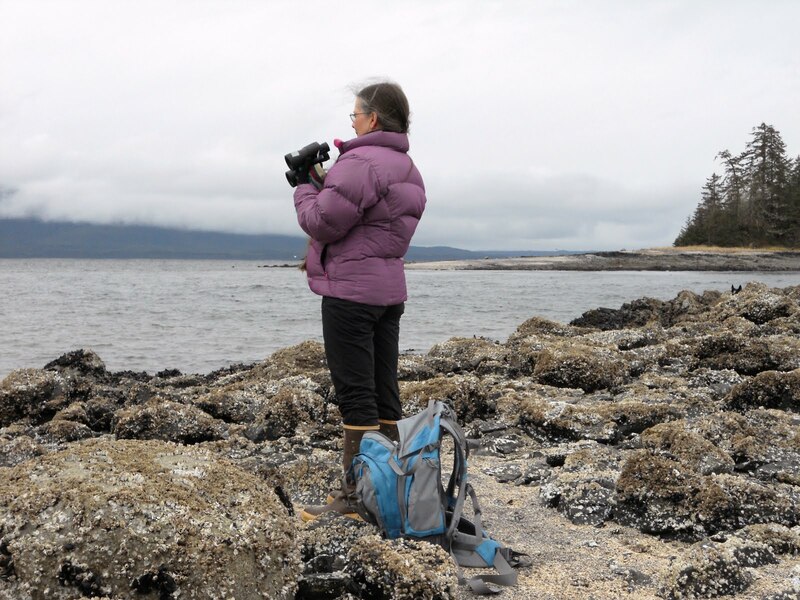 As one of the 4 members of ab-strakt-ed, I sincerely appreciate being featured on your blog. 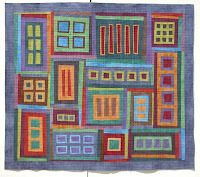 So glad to hear that the quilts spoke to you and offered food for thought. 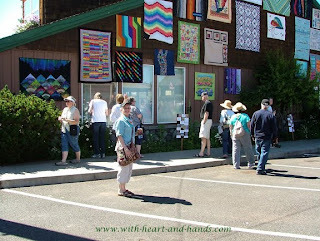 We loved sharing our work with so many quilt enthusiasts at such a fabulous event. I appreciate your leaving a comment and hope you come back and take another peek so you'll know I loved having your stop by and leave a note! Congrats to your group for a wonderful series! Look forward to seeing more if you return next year!! Hi Michele - what a thoughtful post. I really enjoyed it and agree wholeheartedly with your comments about modern art (or quilts) requiring background and talent. The photographs are wonderful and I thank you for sharing! I really enjoyed reading your blog. The quilts are stunning...so many in one place. Lucky you who could see the quilts! Thanks again, Michele! We'll be returning to Sisters next summer with a new exhibit. We have an all-day fabric dyeing session planned for this weekend as a step toward designing our next batch of quilts.